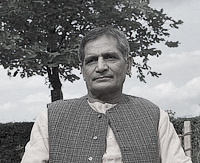 Narayana Press was founded in Rishikesh, Himalaya, in 1955 by the Indian author and philosopher, Swami Narayanananda. At that time the press was primitively equipped with hand composition and a small platen press for lead printing. By the end of the 1950’s, many of Swami Narayanananda’s books had been translated into Danish and published in that language. In 1961, some of his pupils started up a subsidiary of Narayana Press in Copenhagen using a small offset machine and partly home-made repro equipment. At this stage Narayana Press was not yet a commercial organization, producing a journal with a small circulation and brochures, etc. In 1967, the N.U.Yoga Ashrama was founded on an agricultural property near Gylling in Jutland (Denmark) owned by N.U.Yoga Trust Denmark. The Ashrama was first of all a home for former drug abusers and vagrant hippies who had met Swami Narayanananda in India. Meeting him meant a great change for these youngsters, who now started to build up a healthy way of life and a modern, self-sufficient monastic community. Narayana Press now moved from Copenhagen to Gylling. In 1972, the Ministry of Culture donated a small offset machine to the press in recognition of the fact that it had brought a number of young people back unto the right track. From then on, Narayana Press started a commercial printing activity, engaging members of the Ashrama monastery. As no loans were taken out for investment, progress was slow, used machines were bought and, after repair and replacements, were sold at a profit. In this way, the members of Narayana Press were able to acquire an important technical know-how about everything from hand and machine composition, cylinder and lead printing, right up to modern offset technologies. During the 1980’s, Narayana Press enlarged to become a modern and publisher-orientated printing house with about 30 workers, producing photocomposition, optical reproduction and offset printing plates. The machinery facilities were enlarged by perfecting printing machines in formats of up to 65 x 92 cm. Narayana Press had thus become a well established and recognized enterprise. The 1990’s were a period of accelerated development and growth for the company, the electronic revolution brought about a complete change, especially in the context of prepress production. The traditional photocomposition was replaced by DTP (desktop publishing), and the optical plate production was replaced by computer-to-plate. The printing machines were equipped with multi-CCI and computer for job management and ink control. This was a period during which the workers of Narayana Press were re-trained, enabling them to master the new technologies. But even in the midst of this revolution, it was found that knowledge of the classical processes originally acquired was of a fundamental importance in obtaining high-quality graphic products. By the end of the century, it had become clear that the wave of fusions in the printing branch was going to make new demands on the abilities and capacities of graphic enterprises. Narayana Press took up the challenge and from 1999 onwards the company has experienced an unprecedented rate of growth, and with the best personnel and highly advanced equipment, Narayana Press took a place among the major producers of printed quality books.